(CNN) -- Love was in the air on Sunday for Dottie Coven and Keith Stewart. 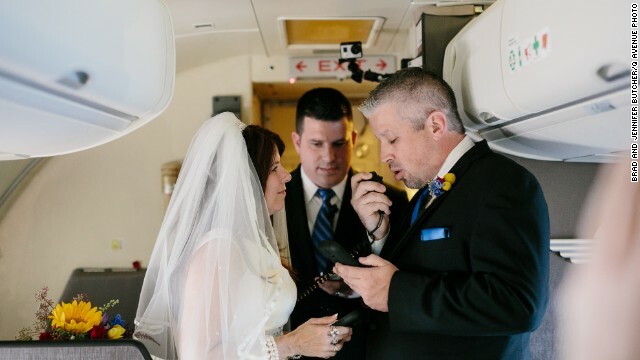 Business travelers and frequent fliers on Southwest Airlines, the couple from Corydon, Indiana, decided there was no place they'd rather marry than while flying. 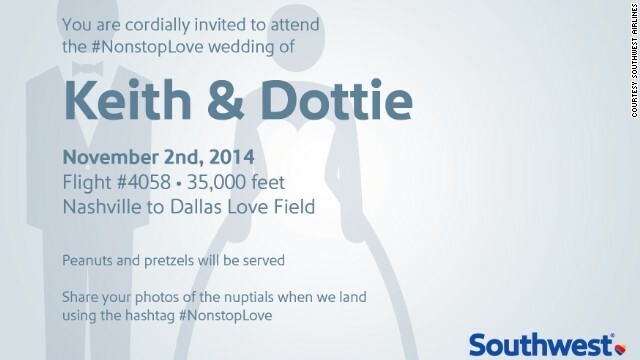 And why not land at the airport known for love -- Dallas Love Field -- after the happy occasion? That's why they approached Southwest with their idea of being married in the air. The airline was game. After all, it's famous for its fun, including flight attendants who entertain, wedding proposals and even rewarding flight attendants who are especially good to customers (After a customer praised one flight attendant on Twitter midflight, the airline publicly honored her with a giant cookie). Frequent travelers Keith Stewart and Dottie Coven got married onboard a nonstop flight from Nashville to Dallas Love Field on Sunday, November 1. They used their frequent flier miles to include their friends and family on the flight. About 100 unsuspecting fellow passengers were invited to join the midair celebration. Southwest Airline was happy to highlight its new nonstop service from Nashville to Dallas. There were modifications for the unique location: "If anyone can show just cause why they might not be lawfully joined together, let them push their flight attendant call button now or forever hold your peace." 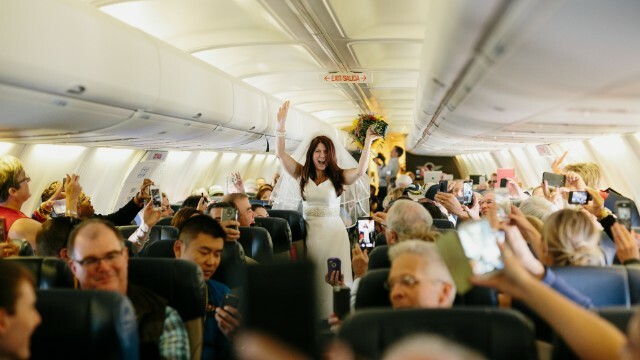 The airline had a reason for highlighting this particular route: The wedding took place on Southwest's first nonstop flight from Nashville to Dallas Love Field.